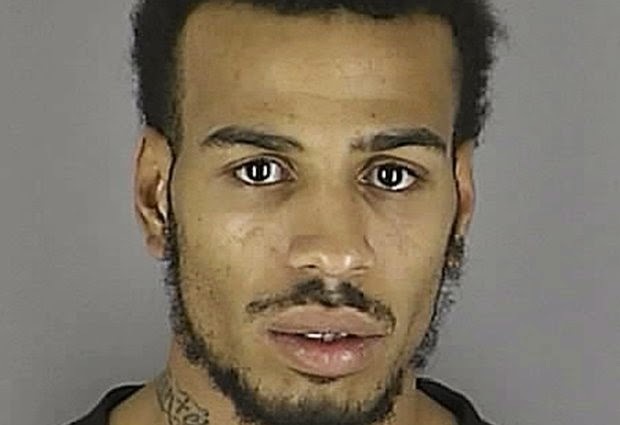 Provided by the Hennepin County, Minn. Sheriff's Office shows Douglas McAuthur McCain. On Tuesday, Aug. 26, 2014, a U.S. official said McCain, a U.S. citizen, is believed to have been killed in Syria and was there to fight alongside a terrorist group, most likely the Islamic State. NEW HOPE,M INNESOTA. (ASSOCIATED PRESS ) — An American man believed to have been killed in Syria was there to fight alongside an extremist militant group, most likely the Islamic State, a U.S. official said Tuesday. Investigators were aware that Douglas McAuthur McCain was in the country to fight with the militant group, but they did not yet have his body and were still trying to verify information about his death, said the official, who was not authorized to discuss by name an ongoing investigation and spoke only on condition of anonymity. A relative, Kenneth McCain, told The Associated Press that the State Department had called to tell his family that Douglas McCain had been killed in Syria. "We do not know if he was fighting anyone," he said. U.S. officials, concerned about what they say is the growing threat posed by the extremist Islamic State group, say surveillance flights and spy planes have begun over Syria on the orders of President Barack Obama. The move could pave the way for airstrikes against the group, which controls a large part of eastern Syria and crossed into Iraq earlier this year. The militant group also killed an American, journalist James Foley, and is holding an American woman hostage. It was unclear when McCain, who had most recently lived in San Diego, traveled to Syria. He grew up outside Minneapolis in the town of New Hope. A cousin, Kenyata McCain, told the Minneapolis Star Tribune that she had spoken to McCain as recently as Friday and "he was telling all of us he was in Turkey." "I know that he had strong Muslim beliefs," she told the newspaper. "But I didn't know that he was in support of ISIS. I didn't think he would be." At an apartment complex in New Hope, Shelly Chase remembered McCain as a friendly boy who welcomed her 9-year-old son, Isaac, when the Chase family moved in some two decades ago. Even though McCain was a few years older, the boys used to lift weights, hit punching bags and play basketball. Both Shelly Chase and her son, now 28, fought back tears as they talked about McCain. "I'm holding in the tears, I really am, because this is hard. He was a good kid," Shelly Chase said. "Someone must have persuaded him." Isaac Chase said he had always looked up to McCain. Chase joined the military in 2007, and said before he left, he knew McCain was running into trouble, sometimes smoking marijuana at the park. Minnesota criminal courts records show McCain had a few minor traffic offenses, including two instances where he was convicted of giving police a false name or ID. "I don't know if he was just lost or what," Isaac Chase said. "He was a good person at heart." He said he last talked to McCain in 2008 when he was home on leave. McCain told Isaac he was proud of him, and he was trying to straighten out his own life, Isaac Chase said. U.S. law enforcement and intelligence officials have expressed concern about the influence of hard-line jihadists who are among the rebels seeking to overthrow Syrian President Bashar Assad. Officials say fighters from the U.S. or Europe looking to join the cause could become radicalized and import those influences and terrorist skills when they return home. FBI Director James Comey said in June that roughly 100 people had left the United States to join the conflict in Syria. Comey said the terrorism threat of today "has spread, metastasized. ... The traveler problem makes it even more difficult, because the people going to Syria are not from any particular demographic. They're not from any particular part of the United States." Comey's remarks came during a visit to the FBI's field office in Minneapolis, which has struggled in recent years with several young Somali-Americans leaving the United States to join the terror group al-Shabab in Somalia. FBI spokesman E.K. Wilson said agents continue to investigate reports that several young men have left the Minneapolis area for overseas locations, including Syria. "We have done extensive outreach recently, as we have the last seven years, but we've had a concerted effort ... over the last few months," he said, as reports of travel to Syria surfaced. Tucker reported from Washington. Associated Press reporters Julie Watson in San Diego and Rhonda Shafner in New York City contributed to this report.